Pet ownership represents a large emotional – and financial – commitment. Whether you buy from a pet store or a breeder, adopt an animal from a shelter, or take in a stray, initial costs are just the beginning of the story. 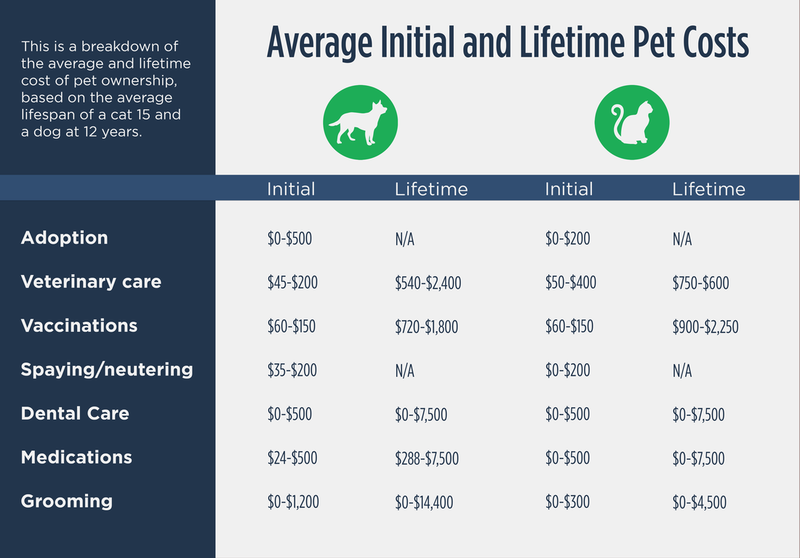 This guide examines the different costs associated with pet ownership and helps you know what to expect, how to plan for these expenses, and potential ways to reduce the financial burden of pet ownership. There are two main cost areas when owning a pet: the initial cost (adoption costs, vaccinations, training, etc.) and then general costs over your pet’s lifetime (food, toys, routine vet visits, etc.) Combining both of these costs together will give you a rough estimate of the lifetime cost of your pet. Even without some of the larger expenses like a fenced in backyard, initial costs like vaccines, heartworm prevention, toys, training, and food can add up to $680 or more. Throw in routine expenses such as dental care ($40 to $80 per year), food ($240 per year), and grooming ($30 per visit) and you’re looking at $300-$400 per year before major medical expenses. One of the first expenses of pet ownership is the adoption or purchase price. The price of purchasing from a breeder is typically influenced by the demand for that particular breed. Reputable breeders will charge fair, if competitive, prices, while backyard breeders will charge high prices to earn a profit. You should avoid purchasing from backyard breeders; their practices are driven by money rather than care for the animals. Backyard breeders often purchase from puppy mills and other unethical institutions. The Partnership for Animal Welfare provides a useful guide for identifying the differences between backyard breeders and legitimate breeders. Legitimate breeders know their breeds and can refer buyers to other satisfied customers, while backyard breeders will sell to whomever is willing to pay. Adoption costs, on the other hand, cover a variety of expenses. Many shelters and rescues will microchip animals, provide medical care and heartworm care, and in some cases even spay and neuter animals. The cost of all this are can be upwards of $800, but shelters rarely ask this much. The upper range of most adoption fees is around $500, but can be higher in some cases. Medical costs are arguably the most expensive aspect of owning a pet; even smaller expenses quickly add up. The average vet visit can be anywhere from $50 to $400, while dental care runs about the same. Vitamins are usually around $100 per year, and preventative medication for fleas and heartworms are each around $20 per month. None of this includes emergency treatments your pet may require. Pet insurance is another expense that can be marked as a medical expense, but is well worth it. We explain pet insurance in a later section. Depending on the breed of dog you own, grooming can be a relatively minor cost or a budget-breaking one. Long haired breeds require much more grooming than short haired breeds, although you can often reduce the cost of grooming by handling it yourself. Brushing your pet’s hair daily and trimming their nails at home can save $50 per month. Pet food will be a large portion of your yearly pet budget. A 50-pound bag of Kibbles ‘N Bits dog food is around $22.98 from big-box retailers. Depending on the size of your pet, this could be enough for a single month. However if you feed a 100% RAW diet like we do here at LaShomb's Pomeranians your spending about $3.19 per day/per Pom. Equipment costs vary wildly depending on the individual. If you need to fence in your backyard, you’re looking at well over $1,000 on average. However, for an indoor pet, you may only need water and food bowls and a few toys. This cost depends entirely on your personal circumstances. Training is an optional cost. Cat owners likely won’t need to pay for training because most cats don’t require it but dog owners have two options: pay for training or train their pet themselves. If you have owned a dog before, then you may be able to get away with training it on your own unless it is a particularly difficult breed. If you’ve never owned a dog, then professional training can be worth the cost. Not only does training reduce behavioral issues, but it can also reduce costs later in the future; for instance, the cost of a lawsuit or medical treatments if your dog bites someone. Dogs and cats are the two most popular pets on the planet, but the differences between these two animals are stark. Dogs tend to require far more attention than cats do. From a financial standpoint, this translates into more expenses. Dogs need to be brushed every day or every few days—more if you own a particularly energetic breed that frequently gets dirty. More energy results in more injuries, and dogs often benefit from training. As a rule, owning a dog will be more expensive than owning a cat. It’s important to decide before you adopt which of the two animals is a better fit for your lifestyle. Adopting a dog from a legitimate shelter assures you first that the dog has been taken care of. Shelters take care of immediate medical needs and vaccinate and treat for common maladies such as kennel cough, parvo, and distemper. The adoption fee covers the cost of this medical care, as well as food, shelter, and transport. Many people prefer to adopt from a shelter. Most of the animals are there because they’ve been abandoned by previous owners or are the victims of puppy mills. Adopting is the most humane option and gives the dogs a second chance. The cost of adoption ranges from $50 for mixed-breed dogs up to $500 for purebreds. While the cost of adoption may seem high, it covers a number of expenses and can actually save you money in the long run. The total cost of everything a shelter provides for a dog often exceeds the adoption fee. Pet stores are usually the go-to option for first time pet owners, but many animal lovers warn against them. Pet stores, particularly smaller ones, often purchase their animals from high-volume breeders. These breeders are more concerned with making a profit than the well-being of the animals. This means that animals purchased from pet stores have a higher risk of health problems than those adopted from a shelter or bought from a reputable breeder. High-volume breeders often keep animals confined to cages for years, only allowing limited amounts of exercise per day. They do this to keep the males and females separated, only allowing them together for the purpose of mating. The Best Friends Animal Society, an organization dedicated to the proper treatment of pets, details the problems with puppy mills and ways the average person can fight back. The average cost of purchasing a dog from a pet store is upwards of $1000, but despite this higher cost, there are few benefits. Unlike shelters, pet stores don’t spay and neuter animals, and most don’t treat illnesses. A legitimate reputable breeder is the way to go if you’re interested in a specific type of dog. Licensed and AKC breeders undergo routine inspections of their facilities and treat their animals with care, so you don’t have to worry about the ethics of their operation. Breeders are the easiest way to get a purebred dog of the type you want. People interested in competing in dog shows will most likely need to go through a breeder to get papers for the American Kennel Club. Another benefit to purchasing from a breeder is that undesirable traits will likely have been bred out. Health and behavioral issues are minimized as much as possible through selective breeding, while the traits a pet owner wants—obedience, loyalty, friendliness, etc.—are encouraged. That said, a breeder can be expensive. 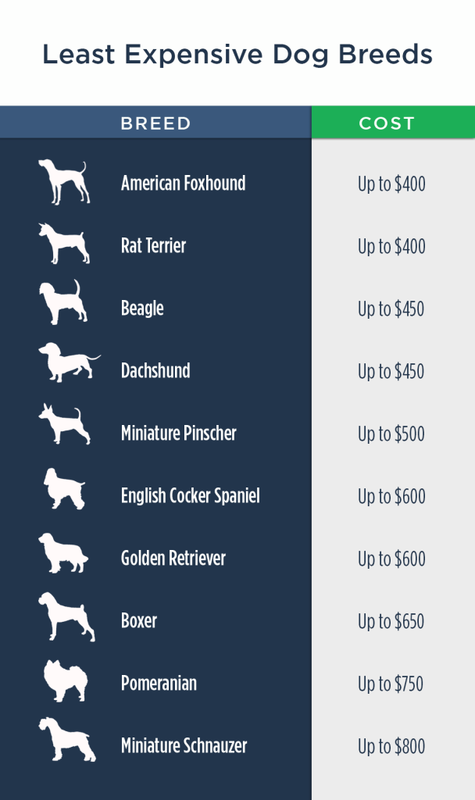 Many dog breeds start at $1,500 or more. NOTE: These prices are only estimates and that real prices can vary significantly due pedigree and location of breeders. If you’re interested in owning a dog but you don’t have a huge budget, these are some of the least expensive dog breeds to own. 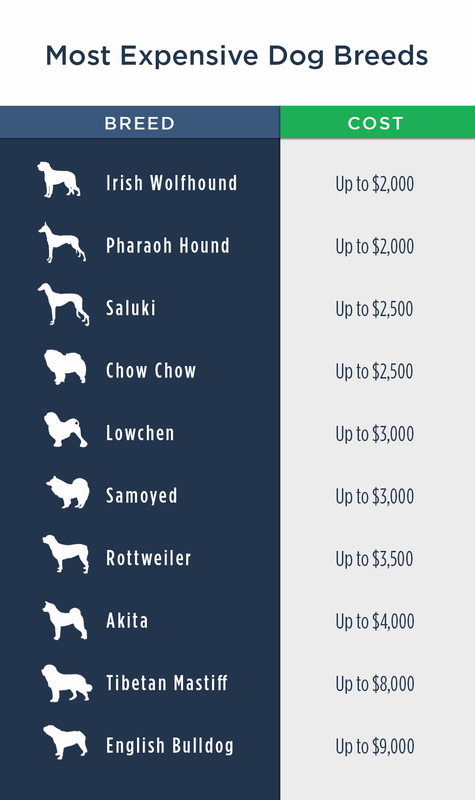 ​NOTE: While these prices on average are relatively cheaper than the expensive breeds, they can cost significantly more depending on factors such as pedigree and certifications. There are number of medical considerations for dogs that must be understood before you adopt. Dogs need vaccinations, flea treatments, heartworm medications, ear and dental care, and unless you intend to breed, spaying and neutering. According to the AKC, dogs need multiple vaccines in their first year of life—and some of these vaccines must be renewed periodically. These include vaccinations for kennel cough, canine distemper, canine hepatitis, canine parainfluenza, coronavirus, heartworms, leptospirosis, lyme disease, parvovirus, and rabies. These vaccinations will cost between $60 to $70 on average, with the rabies vaccine costing an addition $15 to $20. Eliminating fleas is a matter of comfort not only for you, but for your dog too. Animals with fleas are miserable, and fleas can actually carry a number of dangerous diseases. A flea and tick shampoo could cost as much as $40 per year, depending on the size of the dog and the frequency of treatments. If you give your dog a flea pill, you’re looking at around $150 per year. The most popular treatment for fleas and ticks, an insecticide known as Fipronil, can cost as much as $200 per year. Heartworms kill countless dogs each year, and the sad truth is that many of those deaths could be prevented. Heartworm control is one of the most important parts of owning a dog; while they are easy to prevent, heartworms can be very difficult to treat. The cost of heartworm prevention medication is around $15 per month, or $180. The cost of treating heartworms starts at $400. Dog’s ears are particularly sensitive, and their structure can be prone to problems. While most of the issues that affect a dog’s ear aren’t life-threatening, it can be very uncomfortable for your pet—sometimes even very painful. As for a dog’s teeth, they require treatment and care for the same reason humans need dental care. Plaque and tartar can build up on a dog’s teeth and lead to gum disease, weak enamel, and a host of other issues. Ear and dental care is around $40 monthly for both, although specific dental treatments can cost upwards of $1,000 depending on the severity. If you adopt from a shelter, there is a good chance your dog will have already been spayed or neutered. However, if you have to pay for it yourself, expect to spend up to $200+ depending on your location. The surgery is routine enough that it isn’t terribly expensive. Certain breeds of dogs are more prone to medical problems than others. Some are almost infamous for them; for example, pugs and bulldogs. Most flat-faced dog breeds have chronic respiratory issues and are known for loud snoring. While that may be an endearing quality to many people, the snoring is a result of the animal struggling to breathe. German Shepherds are also prone to a number of problems like eczema and hip dysplasia. A good rule to remember is that any animal bred to look a specific way likely has a health issue as a result. King Charles Cavalier Spaniels are prone to brain injury because their skulls have been bred almost too small for their brains, while English Bulldogs face a number of joint issues as well as skin issues. 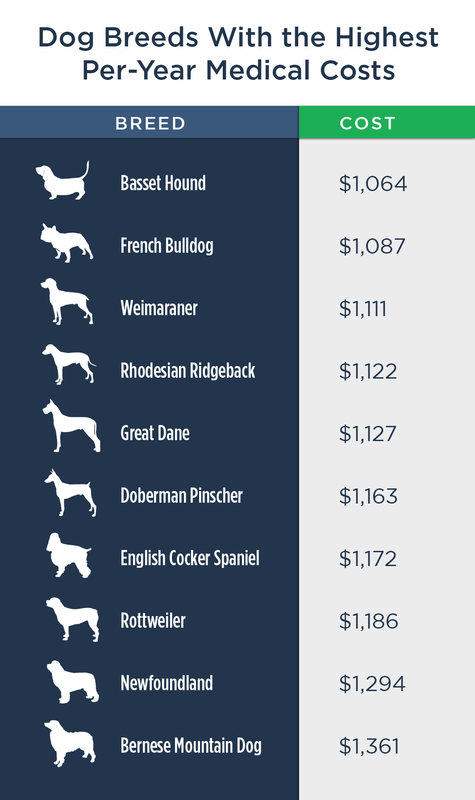 Here is a list of the dog breeds with the highest per-year medical costs. While it may seem like grooming is a luxury or something only dogs competing in showcase events require, it’s a necessity for every pooch. Grooming helps keep dogs clean, comfortable, and prevents potential health problems later in life. Trimming a dog’s nails is a delicate task; cut it too short and you can injure them, resulting in pain and bleeding. The last thing anyone wants to do is hurt their pet. Luckily, the cost for trimming a dog’s nails is around $10 or less. Unless you’re one of the few lucky owners whose dog enjoys baths, you likely know the struggle of chasing a dripping wet, slippery animal around your home. If you think a dog is hard to catch normally, try grabbing one covered in soap. The average cost of a full grooming treatment, including a hair trim and a bath, is between $30 and $90. Trimming a dog’s hair stops it from becoming matted, while baths keep their skin clean and health—and keeps Fido from stinking up the house. It’s commonly joked that teenage boys can eat someone out of house and home, but a large breed of dog can often seem like a bottomless pit of hunger. Most dog food are fine, however, you should always do your research and purchase the healthiest food for your canine family member, even if it costs a premium. In a 2010 article from the New York Times, the author looks at different types of dog food, both premium and non-premium, and demonstrated that the first five ingredients were all essentially the same. This is because pet food must meet certain guidelines before it can be sold. The primary difference between the two types of pet food is that regular food uses more grains and poultry, meat, and fish byproducts as filler. That’s not to say you should let your guard down. There have been multiple dog food recalls, including seven in 2017 so far, because of issues with the contents of the food. One recall (from a brand-name pet store, no less) was because some of the food contained bits of metal. There are only a few pieces of equipment that dogs absolutely need: a food and water bowl, a leash, and a crate. Beyond that, much of the equipment available for dogs is a luxury. However, this cost can increase drastically if you need to make changes to your home. Living in a cul de sac or a neighborhood might mean fencing in your yard so your dog can play outside unsupervised, an expense that can quickly soar over $1,000. A food and water bowl should run you no more than $40, while toys start at less than $5 and increase in price from there. A standard leash can be as little as $10, while a crate can cost up to $250 or more depending on the size of your dog. Training is an absolutely vital part of owning a dog. Whether you train Fido yourself or pay for a professional to do it, training helps keep your dog safe. Knowing he will stop when you tell him to can mean the difference between your dog running into the road or some other danger. Training your dog with a group of other dogs can be doubly beneficial. Not only will your pet learn to listen, but the socialization it gains from being exposed to other dogs will help. Group training costs can range from $40 to $125 and sometimes higher, although puppy training classes will cost less than adult training classes. Private training is ideal for dogs that have behavioral issues or need particular care. A trainer will spend one-on-one time with your dog and help to correct whatever behavior needs correcting. The cost can be anywhere from $30 to $100 for an hour-long session. Premium training is the equivalent of puppy boarding school. Your dog will live in a boarding facility for two to four weeks and receive hours of individual attention each day. This is one of the most effective training methods available, but also one of the most expensive; expect to pay anywhere from $950 to upwards of $2,000. Life happens. Sometimes you’re not able to take your dog with you when you travel, or you have to work late for a few weeks in a row. During this time, you might not be able to give your dog the attention it needs. Hiring a dog walker can alleviate this problem and ensure your pooch gets the right amount of exercise. A half-hour walk averages around $22 per dog. If you need to board your dog and ensure it gets the right amount of care (for instance, before an extended vacation somewhere), you can expect to pay from $25 to $45 per night. If your budget already includes the standard costs of pet care, you should also keep potential emergencies in mind. Just as with children, sometime situations arise you could never have predicted. A sudden illness or injury can mean an emergency visit to the veterinarian; aside from the added charge of an after-hours visit, the procedure to save your pet can cost thousands of dollars. Set up an account specifically for pet-related emergencies. If you set aside just $30 per month, you’ll have $1,080 within three years. While that isn’t much, it can help offset the cost of an emergency treatment. While it isn’t possible to list every emergency that a dog might face, the folks over at Dogster list some of the most common emergencies and symptoms of problems that signal the need for an immediate vet visit. Cost estimates are from Vetary. If your dog displays any of these symptoms, don’t wait. Call your vet immediately and get your pet medical treatment as soon as possible. Pet insurance is exactly what it sounds like: health insurance for your pets. You pay a monthly premium just like you would for your personal health insurance that helps offset the cost of medical care for your pets. While pet insurance can reduce the cost of vet visits, its primary usage is in medical emergencies. Depending on the provider, your pet insurance might have an upper limit on its yearly coverage amount. If this is the case, it’s better to reserve your coverage for a time when it might be needed in its fullest, rather than simply to reduce the cost of veterinary care. The best time to insure a pet is when you first purchase it, especially if it is a puppy. There aren’t likely to be any pre-existing conditions that would increase the cost of insurance or invalidate your pet’s eligibility. The cost of pet insurance can range from $15 per month to as much as $75 per month. The primary deciding factors are where you live, the age of your pet, and your pet’s breed. Animals with higher risk factors such as Abyssinian cats or English Bulldogs will be more costly to insure than a Manx or a Harrier. How often do dogs need to go to the vet? Puppies will require frequent visits to the vet while they are receiving vaccines, but after a year old, most veterinarians recommend yearly visits. As your dog ages, you should take it to the vet at least twice a year. Dogs often need more frequent veterinary visits than cats because they are more energetic, and thus more prone to injury. Pet insurance can be an expensive investment, but think about your financial situation. Do you have enough in savings to handle a potential emergency surgery? You might pay $40 per month for pet insurance and think it would be better nto a savings fund. After three years, you would have a total of $1,440—not enough to pay for most of the major surgeries. $360 per year seems a small price to pay when compared to the well-being of your pet. The Simple Dollar has a comprehensive list of pet insurance providers, as well as a breakdown of why each one holds the spot it does on the list. If you’re interested in purchasing pet insurance, check it out and decide which type of insurance fits you. Tips on Reducing the Cost of Pet OwnershipSo you understand the cost of a pet. Maybe your finances aren’t what they should be, but you still want four-legged companionship. There are steps you can take to reduce the financial burden of owning a pet. If you’re struggling to provide for your pet, there are national programs that provide financial assistance to pet owners in need. The Humane Society provides a full list of these programs, including a state-by-state breakdown. Some only provide assistance for the treatment of specific diseases, while others provide funds to spay and neuter your pet. There are multiple nonprofits that provide assistance to pet owners in need. Many shelters have on-site veterinary care for low cost. Organizations like Red Rover allow pet owners to apply for financial aid if they can’t afford veterinary care, while crowdfunding programs like GiveForward are aimed at pet owners. The cost of preventing diseases and illness is always less than the cost of treating it. Make sure your pet gets enough exercise, has routine vet visits, and learn what the signs of more serious problems are. By monitoring your pet’s health and addressing potential problems before they become serious, you can significantly reduce the cost of medical care for pets. There are some expenses that pet owners don’t think about. For example, if you’re allergic to cats but still want to own one, you’ll need allergy medication. Lower-end allergy medications cost as little as $5 for a pack of 48 pills, but more powerful medications may require a prescription and doctor visits. You might also need treatment for pet-inflicted injuries. Overly playful pets may bite or scratch, and complications like Cat Scratch Fever can be serious or even life-threatening. While it isn’t a guarantee that problems like this will arise, it is important to consider the potential costs when budgeting for a pet. There are also legal costs and considerations. If your dog gets overzealous and bites someone, you may face a lawsuit and be on the hook for that person’s medical treatment. Certain dog breeds are also not legal in some areas. Rottweilers, Dobermans, and Bulldogs are commonly banned or restricted in residential areas. This guide covers nearly every expense imaginable for pet owners. Whether the cost of adoption, medical care, or the standard expenses of food and toys, pets are more than just furry friends—they’re investments. Evaluate your current financial situation before deciding to purchase a pet. No matter how much love you’re able to give, you need to ensure you can provide for their other needs, too.